SO as I promised on my Facebook page here is my weekly article of what I am currently working on. Also known as "What's Weaving Today?" Right now and sadly with a lack of photos, here are my currents works and commissions! Since I do not have photos of what they look like currently I will be using what they will looklike when finished! Hopefully that helps! First lets look at some Butterflies and some Flowers. These are being made on commission by some of my friends from the Nerdish Underground. The flowers at least are for one of the guys at NU but are a christmas present for his nieces! Sweet of him huh? The flowers come in sets of 2 and so do the Butterflies for that matter. The sets cost for just basic flowers and butterflies $8 for the pair. Now he is getting these as hairclips is an extra $2 for the set. Now I can do these as Hailclips, or I can have them as lapels, hair ties can also be added, and these can also be made in to basic pins. Next lets look at a Dragonscale set of Items! 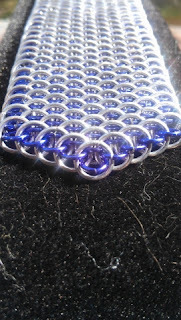 Now Dragonscale is the weave that made me fall in love with Chain Maille so it is only right that it is the weave I dote on the most! 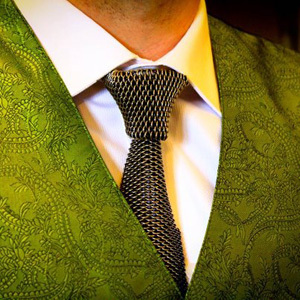 Yes this is a Dragonscale tie! Now as you can see from at least the last 2 photos, Dragonscale has 2 sizes of rings. 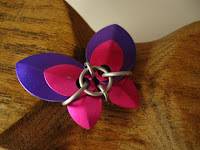 With Dragonscale you can make either the bigger rings or smaller rings two different colors with ease. Dragonscale takes a good amount of time to make. For instance that Dragonscale Tie photo is 20-30 hours of work! and $50 of materials. . . 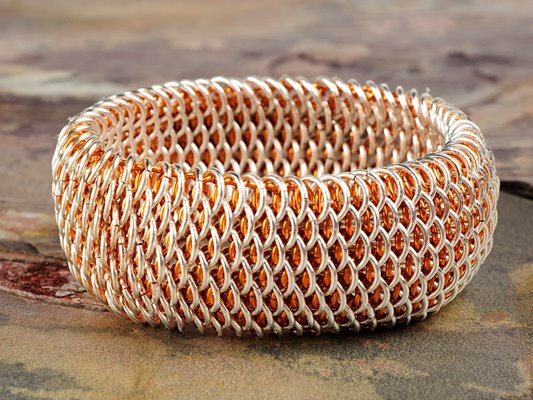 Overall depending if you want the Micromaille version which is what the photo is, that will run close to $400 due to time and cost. 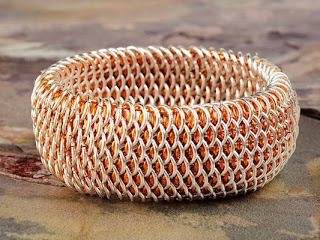 The Non-micromaille is about $100 less due to less work needed. The bottom two photos are not THAT expensive but still take 3-7 hours to complete. I am actually working on a bracelet right now that I will sell for $65 (YAY Christmas Special!) It will look like the bottom photo but have red rings! If you want one commissioned just email me and we can work it all out! I am also working on the Tie for a friend. Good Man, I will have my Male Model show it off when it is done! Lastly I am working on a Dragonscale Belt! This belt is about 2 inches wide and Adjustable but I am making it for someone with a 30 Waist. These come in ALL sizes! Due to the time involved these run about the price of the Tie, $250 + based on length. Lastly aNecklace and Earring set! Sadly I do not have photos for these yet because these are my ownpersonal design. I will give a photo and add details so you can imagine what it looks like ok! At least for the Earrings I can do this. These are Christmas presents and they are as I said my own personal deisgn. So first this is first. The earrings are Mobius Dragon Tears. Now you may have heard of Dragon Tear earrings (there is a youtube video some where. . . ) but these have a different step in them! 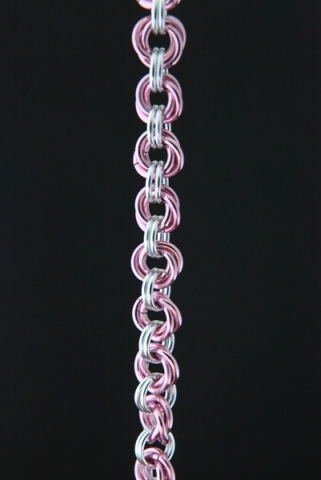 Now for context the Pink and silver chain is what the earrings will look like from the ear to the scales. The Pink rings are what is called a Mobius. These are 2 or more rings linked together (each ring links to each other ring in the Mobius) In this variation it is called a 2 and 2 with Mobius. 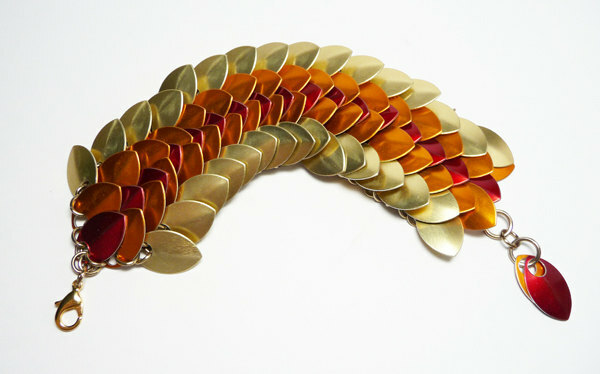 Now at the end of the earring with is only 6 links of the 2 and 2 Mobius long will have 2 Scales like the ones you see in the picture of the flowers. I am making it so the bigger scale is the person's top favorite color while the smaller one is their second pick. Simple eh? These do take a bit of time to do and each of these sets cost only $15 each. Now the Necklace is special, I call these 2 necklaces, Circles of Love. You see people have a belief that those to the leftof you are the ones you love and to the right is your strength. Most cases this is one and the same person, sometimes it is not. In this case we are going with the latter. So each of these necklaces are using small scales that are linked in a Scale;Scale;;Scale;Scale;;Scale;Scale (; = ring links) at the center of these and where they are connected is a Celtic Star. Underneath the Celtic Star there is the connector. Now the star is made from the favorite colors where the points are their secondary colors and the body is the primary. The total set runs at $80+ normally but due to the Christmas Special (will go into detail next post on this) They are now just $60 a set! That is 2 earrings and a Circle of love with the Pendent of your choice in the center. As always if you are interested just send me an Email and we will work out the details!